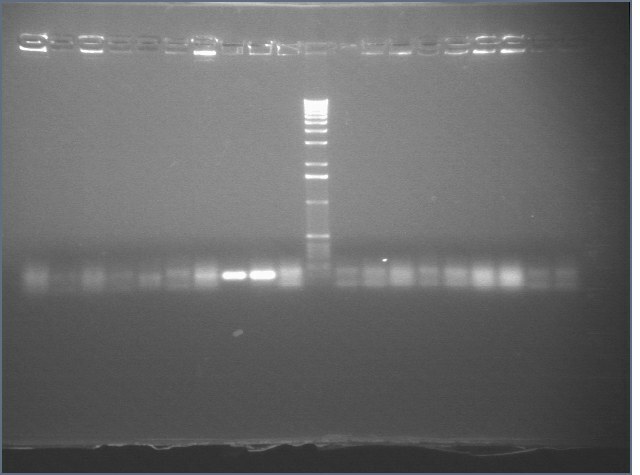 HO-pcyA and ompR bands excised, purified, and digested (ApaLI & Kpn overnight). 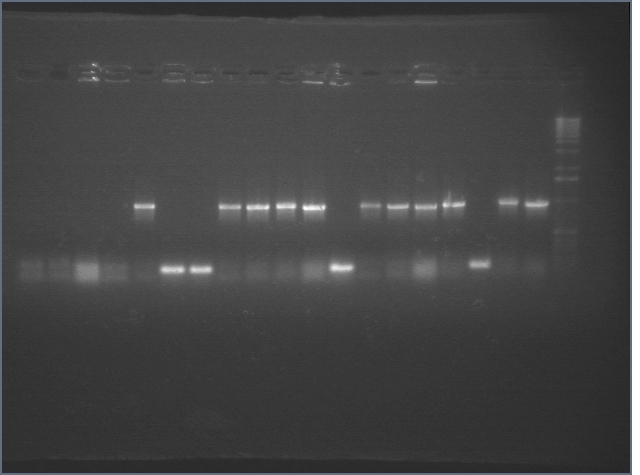 We picked 24 colonies each of old putative P98 and newly transformed putative P98+63 for colony PCR using the BioBrick primers and 55°C annealing for 30 cycles. If the colonies contained mtrB, a band at ~2.1 kb should appear. No colonies appeared to contain mtrB. We ligated P105 and P1/P3 not BB, and mtrB not BB and P1/P3 not BB. 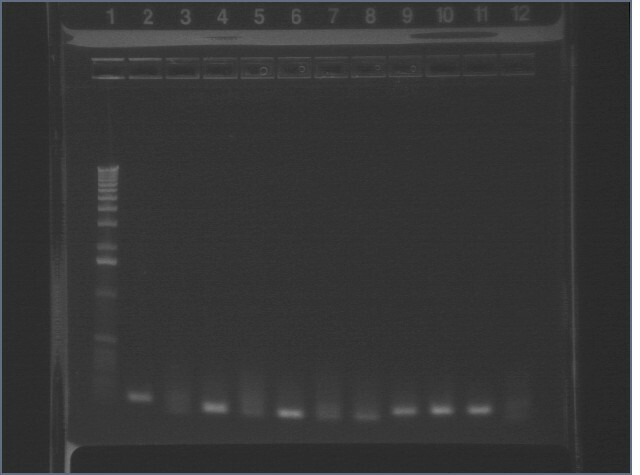 We tried letting the ligation reactions run for 5 and 10 minutes. We used P1/P3 not BB from 08/05 and from another date (older). We transformed using TOP10 and DH5α. We also retransformed P108, the Lac QPI with a high constitutive promoter in a p15A vector. These had a few white colonies. 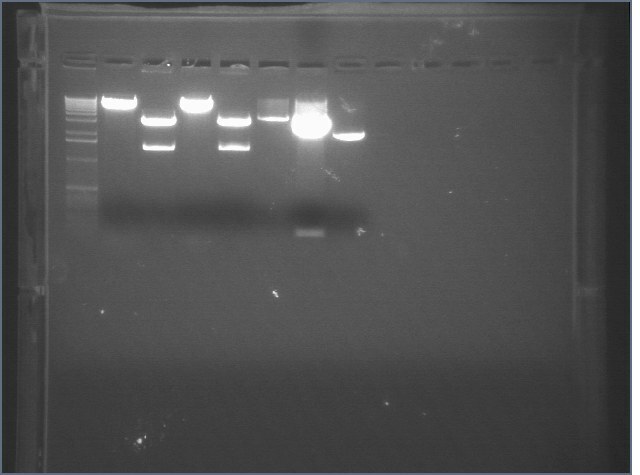 Colony PCR, however, indicated that the correct PCR product was not incorporated. 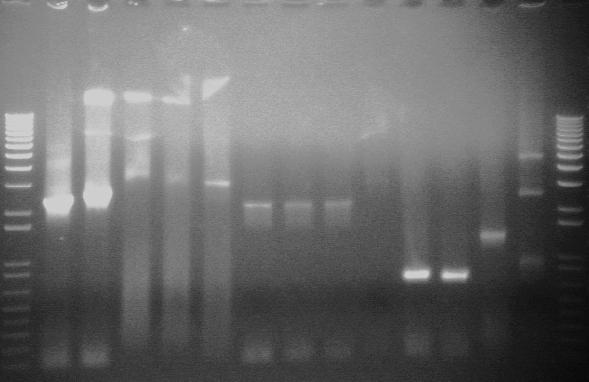 All three ligations yielded >50 colonies on the TOP10 cell plate with a 5 minute ligation in all combinations (HO-pcyA and ompR with P1 and old P3; CDF with P3). 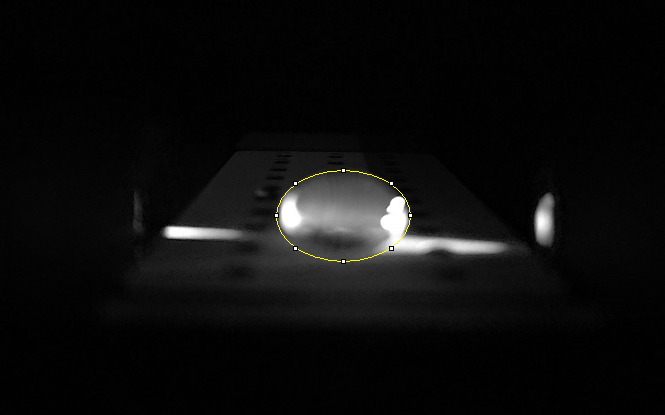 The P90 (CDF+P3) did not fluoresce. The DH5α cells did not have nearly as many (<5) and ligation times (10min, 30 min) did not appear to be significant. 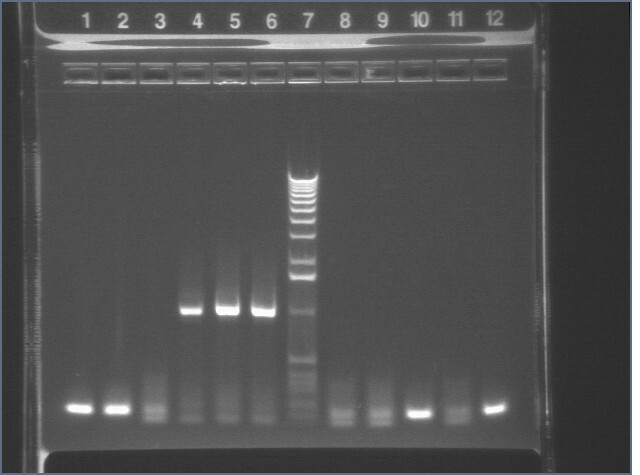 We picked at least 18 colonies from each ligation set, patched a master plate, inoculated liquid cultures, and performed 12.5 μL colony PCR reactions. The BBp/sfx primer pair was used, annealing temperature was 50°C for first 10 cycles and 54°C for rest of the cycles. 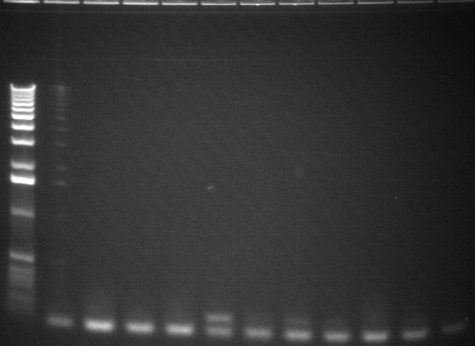 2 controls were performed: one using a picked P20 colony, and another with miniprepped P20 plasmid. 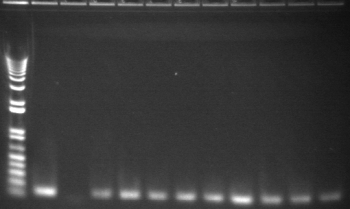 We ran the digests to see if PCR mutations could have introduced an internal cut site. 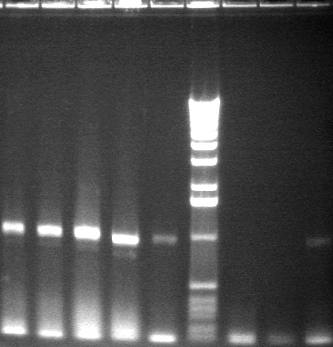 However, even with the small amount of purified digest we had left, we could see a properly sized band for each of P1, ompR, and HO-pcyA PCR products. 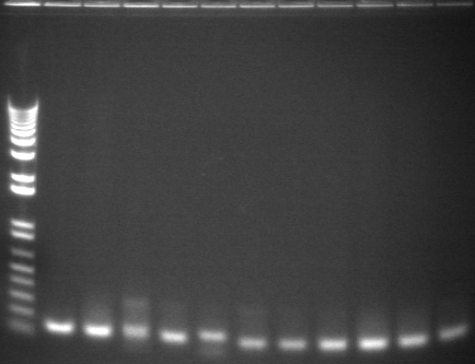 E1 P75b + P63b (6:2) Kan 1 Fluorescent, 1mm. Fluorescent colony was picked for liq culture and restreaked. 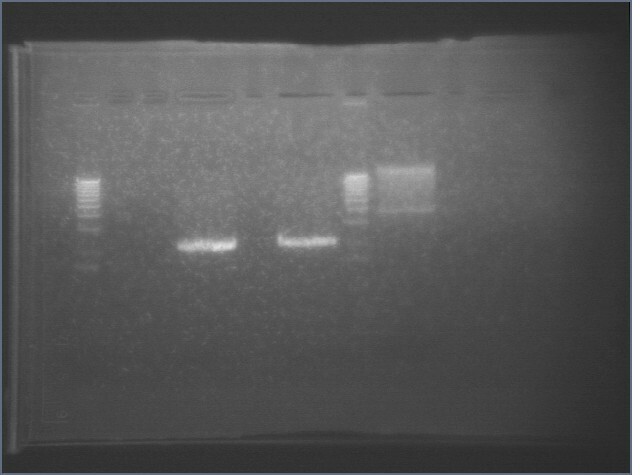 Miniprep sent for sequencing-- ligation confirmed by sequencing (8/5). 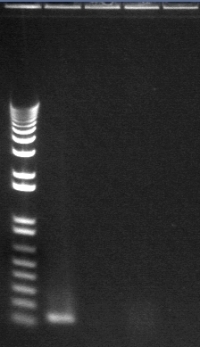 Strange bands, but sent several clones for sequencing anyway. Done in tandem and side by side with Christina (except for digestion). 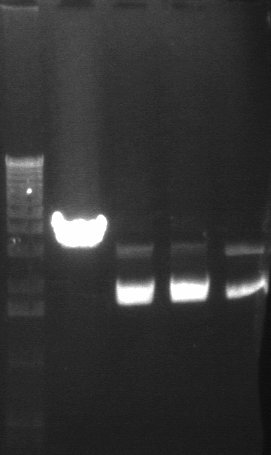 Used dephosphorylated and undephosphorylated vector. Christina digested the same samples of P63, cI857 RBS GP and PP, and cI857 BIG GP and PP with EcoRI buffer. P104 was cut 8/6 in the morning. 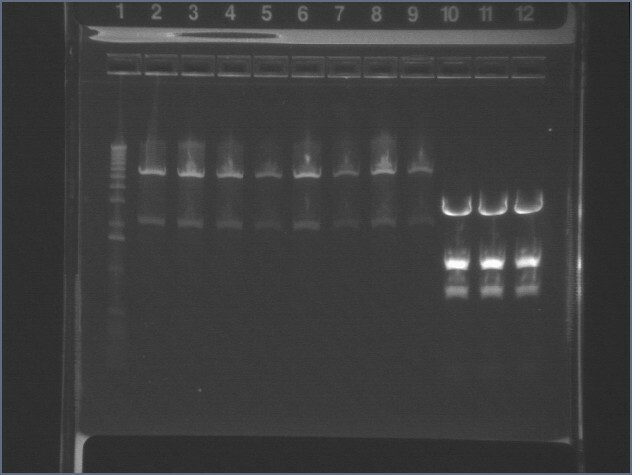 Accidentally mixed P63c and P104 so plated each of those ligations in Amp and Kan selective plates. E1 P63 + RBS PP B to be sequenced Monday. 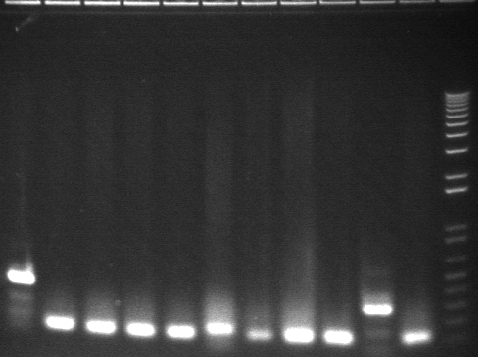 All of the bands in the third gel indicated re-ligated vector. Ligations were re-done with newly digested vector because of mishap in 8/6 ligations. 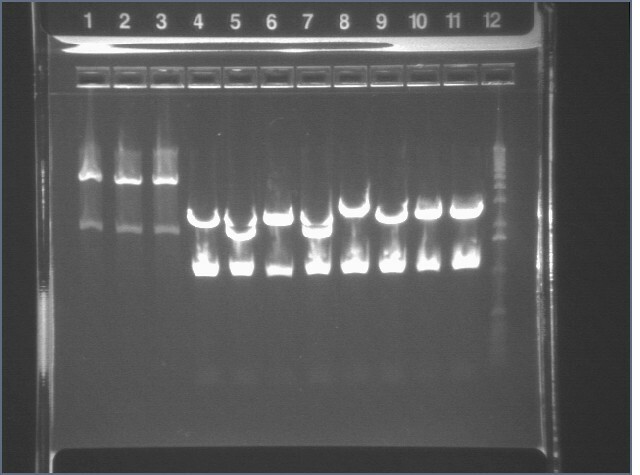 Bands were extracted, purified, and dephosphorylated. 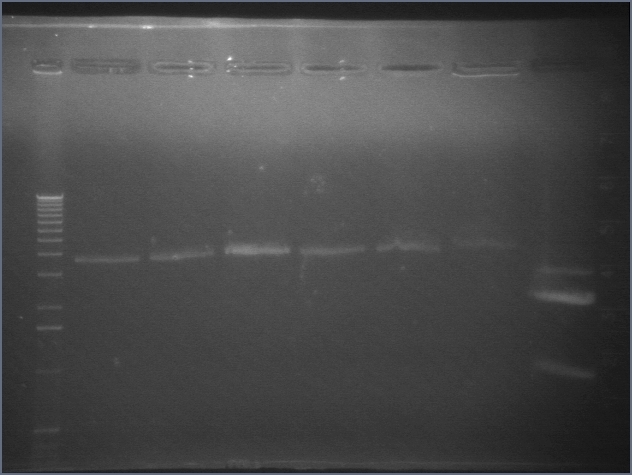 Vector backbones were ligated with cI857 digested 8/5. E1 P104 + RBS PP Kan 30 colonies, 10 fluor, rest no fluor 30 big 2-3mm colonies, 2 1mm colonies. E1 P104 + BIG GP Kan 4 small 0.25 colonies? 4 1mm colonies. E1 P104 + BIG PP Kan 0 colonies 5 small 0.25mm colonies. 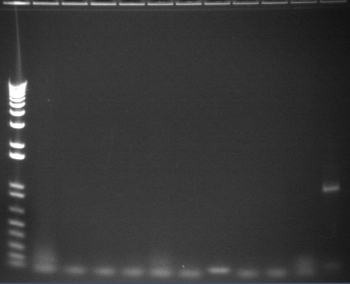 E1 P104 + RBS GPC Kan 3 1.5mm colonies, no fluor 3 big 3mm colonies, 2 1mm colonies. E1 P104 + RBS PPC Kan 1 0.5mm colony 1 2mm colony, no fluor, and 2 1mm colonies. E1 P104 + BIG GPC Kan Lots of small 0.25mm colonies 100 0.5-1mm colonies, no fluor. E1 P104 Dephos only Kan 1 colony on edge of plate 1.5 mm 2mm colony on edge, and 3 0.5-1mm colonies. 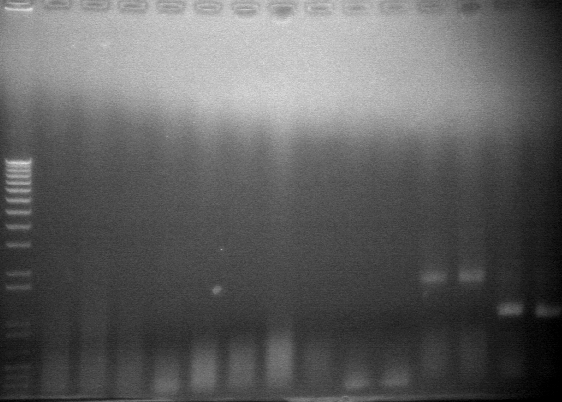 Restreaked some non-fluor colonies from RBS ligations/ transformations to see if repressor is being repressed-- grew in 37 and 42 degrees. No perceived difference in fluor/ no induction. 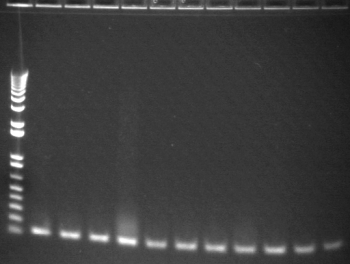 3 bands in second gel indicate re-ligated vector. P18+ P63 not confirmed by sequencing yet. RBS TOPO 1,3, and 5, and P18+ P63 EX 1-4 were extracted and purified. Update: At least P18+ P63 1-2 have been sequence confirmed. 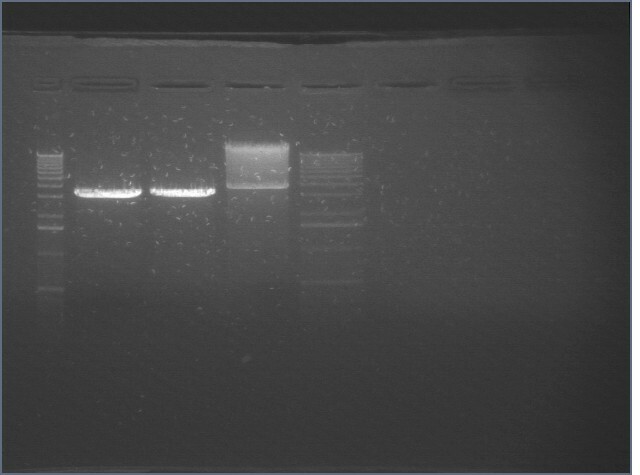 We digested mtrB with ES and XP so that we can put it into the P63 (terminator) and P97 (RBS) vectors. 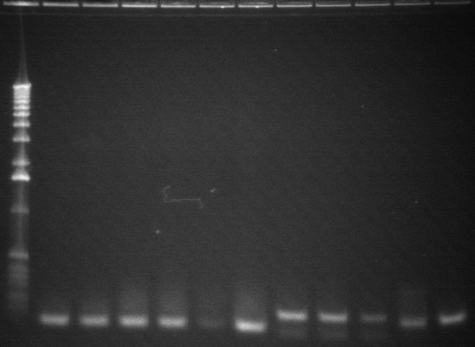 We also digested P97 with SP (and dephosphorylated it). 4, 6, 14 look like they have potentially correct products, so liquid cultures were grown up. 14 is incorrect- it's just P1 in pSB3K3. None appear to be correct. 65, 69, 70, 78, 79, 80 picked. 65 sequence did not read properly. 82 is wrong- mystery sequence. 87 and 95 are BLAST to pHELLSGATE ?! 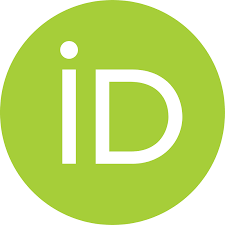 We ligated P17 in a p15A vector (P1 or P3) to P38 and P39. We used a vector to insert ratio of 1:7. We also prepared a ligation reaction with 1 μL vector (P17) and 7 μL water as a transformation control. 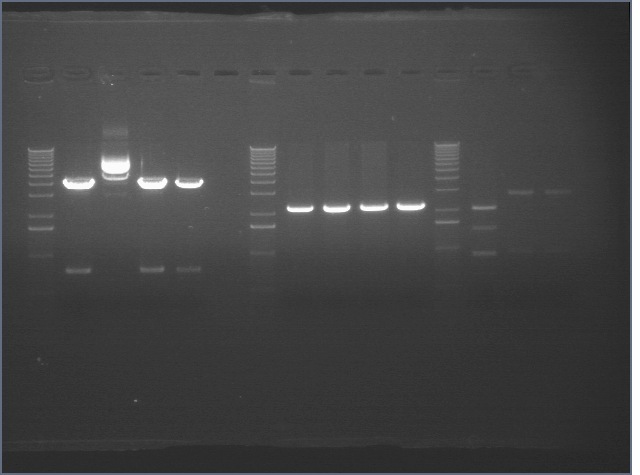 We transformed 50 μL TOP10 cells with 7 μL DNA and 100 μL DH5α cells with 7 μL DNA. 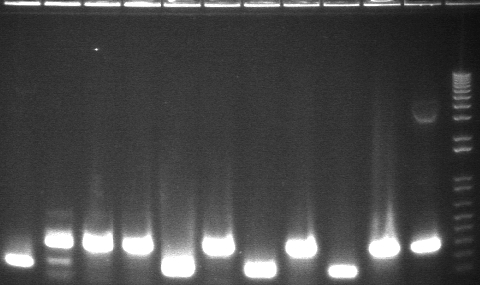 We also used 7 μL of the vector-only ligation to transform 7 μL DH5α cells. 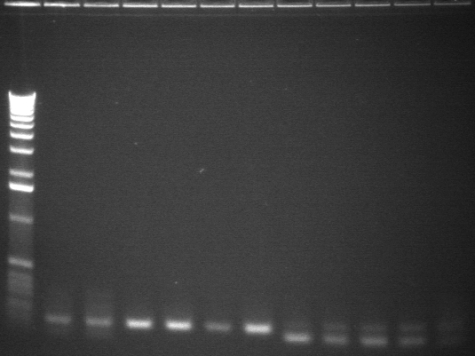 To test the Lac QPI system, we ligated P45 (RBS+GFP+terminator) to P108. We used a vector to insert ratio of 2:6. We also prepared a ligation reaction with 1 μL vector (P108) and 7 μL water as a transformation control. 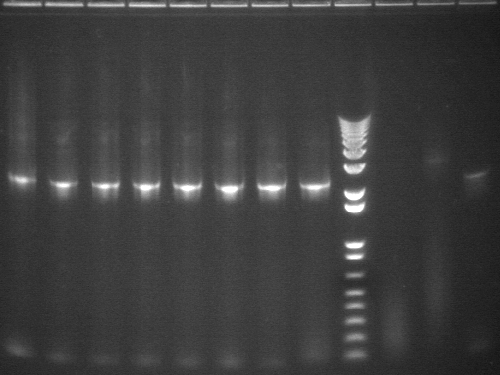 We transformed 100 μL DH5α cells with 7 μL DNA and we also used 7 μL of the vector-only ligation to transform 7 μL DH5α cells. 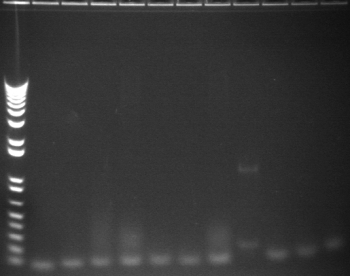 We picked all of the noncontrol colonies and one control colony for colony PCR using the BBp/sfx primers. 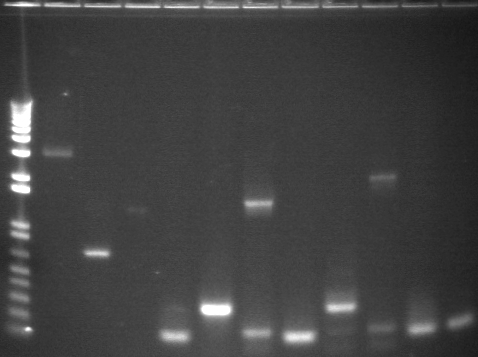 Since the bands are at least plausible, the P38/39 in P1/3 samples were grown up and miniprepped. 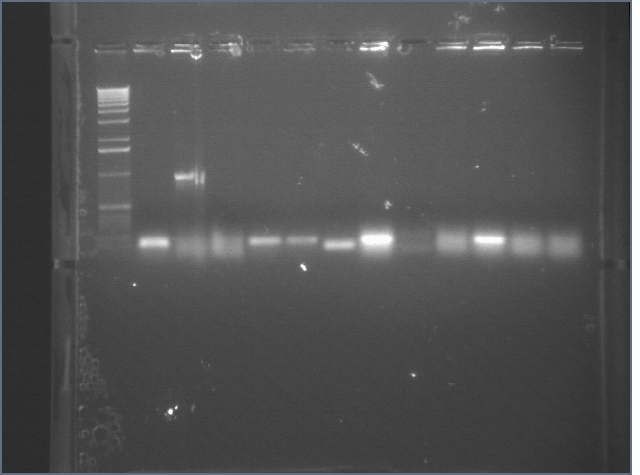 We retransformed 5μL of the P39+17 in P1/3 ligation into 50μL DH5α and obtained two colonies. 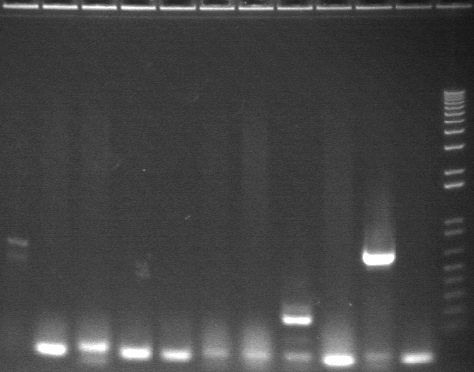 Colony PCR shows that one of these does not contain the right construct. The other was set up in 5ml culture. We retransformed our old P108+45 (2:6 vector to insert) ligation and the old vector control. 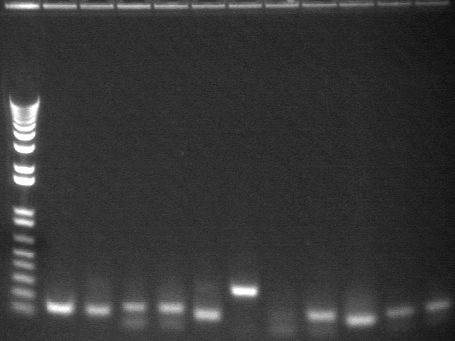 We also did this ligation over with a 2:1 molecular ratio of insert to vector. Both P108 (4155 bp) and P45 (876 bp) were about 17 ng/μL. We used a ratio of 5.4:2.3 vector to insert by volume. We attempted to transform the following parts: I732017, E0435, E0435, I732005 into our competent DH5α. E0435 (on CM) had 0 colonies). The others (on Carb) had 10-20 extremely small colonies (after 16+hrs of incubation) each. We picked 2 of each for liquid culture, but none grew. We requested the parts directly from MIT. This page was last edited on 19 August 2008, at 17:06.